Here is a pop quiz for you folks that are bored of Jeopardy. California is desert. Florida is a swamp. We build concrete slab-on-grade in both places. Which place has more slab moisture problems? Yes, you guessed it, California. Why? In California they place sand between slabs and plastic vapor barriers—in Florida they don’t. Almost everywhere (except “California”) that slabs are placed on the ground—a plastic sheet—a vapor barrier—is located directly under the concrete slab and on top of the ground (Photograph 1). This plastic sheet is in direct contact with the concrete—as it should be in a rational world. But when we get to California we end up with sand or granular material between the plastic sheet and the concrete (Photograph 2). Photograph 1: Florida Slab—Note the continuous polyethylene sheet extending to the perimeter formwork completely isolating the concrete slab from ground contact. The saying “I have swampland in Florida to sell you”—is true. But if the concrete is not in contact with the “swampland” the swampland does not cause grief to floor finishes installed on top of the slab. Photograph 2: Slab-on-Grade Done Wrong—Note the layer of granular material over the top of the plastic vapor barrier. Liquid phase water will be held by the fines in the granular material creating a reservoir of water that can only dry upwards into the slab leading to problems with floor finishes and floor coverings. Photograph 3: Moldy Carpet—Carpet on slab over sand over plastic sheet. The carpet “breathes”—a good thing and allows the water entering the slab from underneath to exit into the building to be removed by the air conditioning system or by ventilation. Unfortunately, the plastic sheet over the top of the carpet traps the water in the carpet and the carpet becomes “stinky.” The same thing happens to furniture sitting on the carpet—and under kitchen cabinets installed over slabs. So, the easy answer is to have no furniture if you have carpet and to have no cabinets. Photograph 4: Vinyl Floor Tiles—Vinyl floor tiles are vapor barriers that prevent drying of the slab. The concrete does not care if it is wet or if it stays wet—in fact it is happy to be wet. The vinyl floor tiles themselves also don’t care if they touch wet things. The problem is the adhesive between the vinyl floor tiles and the concrete. Most adhesives today are latex based and very sensitive to alkaline environments–high pH–like concrete. Sticking stuff that does not breath to concrete that is wet or gets wet with a latex based adhesive does not work. The adhesive “re-emulsifies” (goes back to a “gooey” state) in the wet alkaline environment. This typically results in moisture problems with floor coverings (Photograph 3 and Photograph 4). The sand layer becomes saturated with water from wet curing (water added to the top of the slab leaks down into the sand layer through service penetrations) or from irrigation (water added to the ground at the building perimeter enters the sand layer from the side or from underneath) or from rain (see wet curing and irrigation). The sand layer cannot dry downwards by vapor diffusion because of the plastic sheet—it is a vapor barrier after all. In fact that’s why we have it under the slab. We want a vapor barrier under the slab. ** We want to prevent water vapor from coming up from the ground into the concrete slab. But it works both ways–it prevents water vapor from going down as well. Bummer. It gets worse. The water also can’t drain out of the sand because it is held there by capillary forces. So even if we perforate the plastic sheet, drainage won’t happen. You can’t drain water out of a sponge. What if we used “pea gravel”? Nope, large quantities of water are still held in the pea gravel—think surface area of the gravel and the fines in the pea gravel. Pea gravel does drain, but it retains huge amounts of water even though it drains. Now for the real ugly part. The sand layer is wetted by “liquid phase wetting” in a time frame measured in minutes. Whereas, the sand layer can only dry upwards by “vapor phase drying” in a time frame measured in years. You can do a simple experiment at homeboys and girls. Take a paper napkin and wet it by putting it in a cup of water. Now pull it out. It got wet in seconds didn’t it? Now hold it horizontally in the air and wait for it to dry. Takes a long time doesn’t it? Now do it again by placing the wetted paper napkin over a plastic sheet and covering the top of it with a layer of concrete. In the real world a 15-minute liquid phase wetting event can take years to dry. So where did the idea of putting sand between plastic and concrete come from? Like most bad ideas, it arose from good intentions—it was an attempt to reduce the curl of concrete slabs due to uneven drying. If a slab dries only from the top—the top becomes drier than the bottom—duh…The top shrinks relative to the bottom and the slab edges curl upwards. This is not a big movement and is not a big deal except where you need ultra flat floor systems—like in chip manufacturing plants. Slab curl is very easy to control, use a low water-to-cement ratio (less than 0.5) and wet cure the top (wetted burlap works—Photograph 5). Or just use a low water-to-cement ratio and forget about doing anything else. Photograph 5: Burlap Cure—You just can’t beat curing concrete slabs the old fashioned way with wetted burlap. This is a project in Sacramento, CA that is obviously supervised by an old guy who knows stuff. Photograph 6: Fluted Steel Deck—We seem to be able to place concrete slabs on fluted steel decks without needing a sand layer to control curl. Okay, so we don’t need the sand layer to handle the “curl” thing. But what about using the sand layer to protect the polyethylene? Hah. The polyethylene does not need protecting. You can poke holes in it, you can puncture it, you can tear it, you can leave gaps in it, and pretty much have your way with it as long as it is in direct contact with the concrete. Huh? But, but, vapor barriers have to be continuous and free from any holes. Actually, no. Air barriers need to be continuous and free from holes, but vapor barriers do not need to be. Lots of vapor moves by air movement, not a heck of a lot of vapor moves by vapor diffusion. The concrete slab is the air barrier, and the ripped and torn and punctured polyethylene sheet is the vapor barrier. It’s that Fick’s Law thing. Diffusion is a direct function of surface area—if I get 95 percent of the surface covered I am pretty much 95 percent effective—and the parts that are left I have filled with concrete which is also pretty good as a vapor barrier. I could wear golf shoes and march around the plastic vapor barrier and not do much damage. But put that sand layer in there and you are doomed. Yeah, but if I don’t put the sand layer in there it will take too long to finish the floor. Yes, that’s true if you use crappy concrete with too much water in it. The easy answer is don’t use crappy concrete. See water-to-cement ratio less than 0.5 above. We actually have the opposite problem now in California. 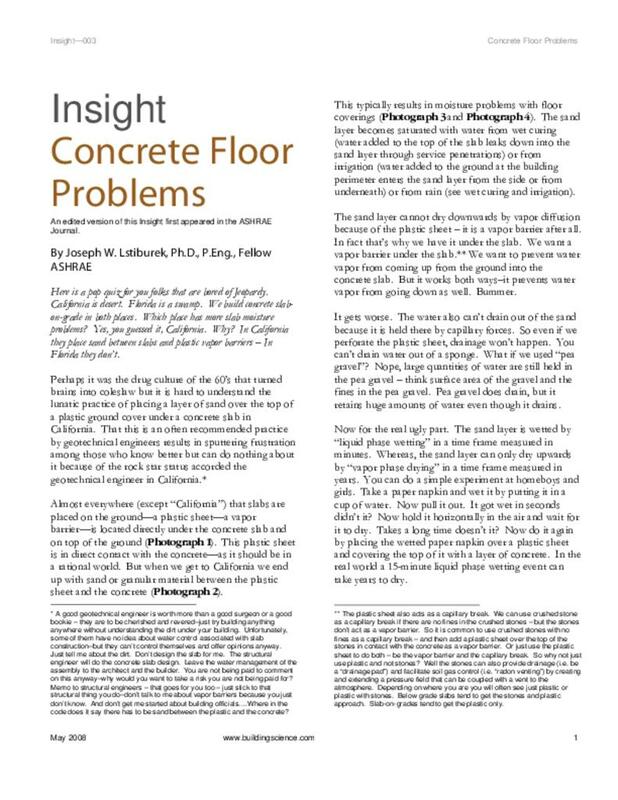 Real structural engineers are now involved in slab design – the adults are now in the game—and they are using lots of very, very good concrete with very, very low water-to-cement ratios and the structural engineers are very concerned that the sand layer under the slab will desiccate the concrete mix and affect the cure. So they are saturating the sand layer—yes, you guessed it, wetting it with a hose—so that it does not dry the concrete too quickly. Here’s an idea—get rid of the sand and put the concrete right on the plastic sheet so that the bottom of the concrete mix does not dry out. But what about cracking? If I don’t put the sand layer in I get cracking. Use control joints. Duh. And then when all else fails I get the “American Concrete Institute” calls for the sand layer argument. Well, that’s not true, and they don’t. ACI changed its recommendations in 1996. Check out the “Guide for Concrete Floor and Slab Construction 302.1 R-96” and go to the Addendum and enjoy. So what do I do if I have a wet slab because some rocket scientist insisted on a sand layer between the plastic sheet and the concrete? Or what do I do if I have a wet slab and no plastic sheet at all? Epoxy. That’s it? Well….kinda. The nuances are sort of important though. The problem is pretty fundamental to understand_we have to stick something that does not pass water vapor to a concrete surface that has a high pH. We need to use something that is not affected by a high pH—and there are epoxy coatings that can do this (Photograph 7). Or we have to lower the pH and make sure it stays low and then stick something to the top. Easy to say, not necessarily easy to do. It’s not that we don’t know how to do this, but it’s that most folks who know how to do this don’t want to share information about how to do it because there is big money in knowing how to do this. Photograph 7: Epoxy Coatings—Epoxy coating must either be compatible with a high pH (concrete with an impermeable finish will typically have a pH of near 14) or the concrete must be treated to reduce the high pH in such a manner that it stays low prior to coating with epoxy. Control joints are a separate challenge—they must be filled with a completely vapor impermeable sealant to prevent any evaporation from the joint. Evaporation from the joint can lead to salt accumulation and osmotic pressures that can lead to coating blistering. Finding an epoxy coating that is compatible with a high pH can be a challenge—and if we were in a bar I would give you a couple of names—but the rules don’t let me tell you manufacturers names here. Suffice it to say, if they are foreign sounding and very expensive they will probably work. There are also some pretty impressive “domestic” technologies that involve treating concrete slabs with lithium penetrants that plug capillary pores and neutralize alkali’s that then get top-coated with epoxy coatings. What we have learned the hard way is that acid neutralizing does not work nor does using calcium silicate-based penetrants. The acids leave salt residues and the calcium silicates don’t completely react leaving behind the alkali’s we were worried about in the first place. On a positive note, calcium silicate-based penetrants do clog up the capillary pores—i.e. cause “arterial sclerosis” for concrete and do reduce vapor emissions—but they should be limited to concrete slabs that do not get covered with impermeable floor finishes. So they are pretty good for exposed concrete floors that will remain exposed. A less impressive, more primitive, but very effective technology is to install a ceramic tile floor over a damp concrete slab. The grout joints in the tile floor allow the slab to “breathe.” This approach has limitations—really “trashed” slabs with “high” vapor emissions can’t be “fixed” this way. One of the main reasons is that most ceramic tile floor adhesives are “modified.” This means they have latex polymers in them that are very sensitive to highly alkaline environments. Oops. Even new assemblies get into trouble – specifically vinyl composition flooring (Photograph 8 and Photograph 9). When these types of highly impermeable flooring systems are installed over concrete slabs cast over steel fluted decks high alkalinity at flooring slab interfaces can cause debonding of the flooring. The best strategy is to coat the top of the concrete slab with an epoxy coating prior to the installation of the flooring. Alternatively, don’t use fluted steel decks—use removable forms so that the slab can dry downwards—obviously not a solution for slab-on-grade construction. Photograph 8: Vinyl Composition Flooring—The best strategy is to coat the top of the concrete slab with an epoxy coating prior to the installation of the flooring. Waiting for the slab to dry is typically not an option as this may take a year or more. Alternatively, don’t use fluted steel decks—use removable forms so that the slab can dry downwards—obviously not a solution for slab-on-grade construction. Photograph 9: Failing Vinyl Composition Flooring—When these types of highly impermeable flooring systems are installed over concrete slabs cast over steel fluted decks high alkalinity at flooring slab interfaces can cause de-bonding of the flooring. With really “trashed” concrete floor systems a pretty much bullet proof repair approach (and not too shabby for new construction either) is the use of dimpled plastic sheet membranes (Photograph 10 and Photograph 11). These membranes use pressure equalization (Figure 3) to address vapor transmission. An airspace is provided over the top of a wet concrete slab. This airspace is bounded by a vapor impermeable chamber (outward evaporation is not possible) and equilibrates with the slab. The vapor pressure in the airspace tracks the vapor pressure in the slab and stasis is achieved. So how to stick this dimpled sheet membrane to the wet slab? Use cement. Concrete is cement with aggregate. And apparently cement is compatible with cement. Who knew? Photograph 10: Dimpled Plastic Sheet Membrane—Note the airspace created by the profile of the sheet membrane. Photograph 11: Tile Installation—Tile or other floor covering is installed over the dimpled plastic sheet membrane either as a repair approach for wet concrete slabs or in new construction. Figure 1: Slab-on-Grade Done Right—Concrete slab is isolated from ground contact with sheet polyethylene. Note that the polyethylene extends under the grade beam and upwards to grade. Latex paint over the exposed portion of the slab prevents liquid phase water from being absorbed by the concrete—but allows vapor phase water to leave the slab thereby facilitating drying. Also note the capillary break isolating the wood framing from the slab. Figure 2: Wood Floor—Wood floors can be installed over damp slabs coated with epoxy coatings. Figure 3: Vapor Pressure Equalization—An airspace is provided over the top of a wet concrete slab. This airspace is bounded by a vapor impermeable chamber (outward evaporation is not possible) and equilibrates with the slab. The vapor pressure in the airspace tracks the vapor pressure in the slab and stasis is achieved. * A good geotechnical engineer is worth more than a good surgeon or a good bookie—they are to be cherished and revered—just try building anything anywhere without understanding the dirt under your building. Unfortunately, some of them have no idea about water control associated with slab construction—but they can’t control themselves and offer opinions anyway. Just tell me about the dirt. Don’t design the slab for me. The structural engineer will do the concrete slab design. Leave the water management of the assembly to the architect and the builder. You are not being paid to comment on this anyway—why would you want to take a risk you are not being paid for? Memo to structural engineers—that goes for you too—just stick to that structural thing you do–don’t talk to me about vapor barriers because you just don’t know. And don’t get me started about building officials….Where in the code does it say there has to be sand between the plastic and the concrete? ** The plastic sheet also acts as a capillary break. We can use crushed stone as a capillary break if there are no fines in the crushed stones—but the stones don’t act as a vapor barrier. So it is common to use crushed stones with no fines as a capillary break—and then add a plastic sheet over the top of the stones in contact with the concrete as a vapor barrier. Or just use the plastic sheet to do both—be the vapor barrier and the capillary break. So why not just use plastic and not stones? Well the stones can also provide drainage (i.e. be a “drainage pad”) and facilitate soil gas control (i.e. “radon venting”) by creating and extending a pressure field that can be coupled with a vent to the atmosphere. Depending on where you are you will often see just plastic or plastic with stones. Below grade slabs tend to get the stones and plastic approach. Slab-on-grades tend to get the plastic only.